Toronto, April 8: Libya is seeing intense fighting near its capital city Tripoli as renegade General Khalifa Haftar has launched an attack with an aim to capturing the city. However, the UN-backed government has vowed to retaliate and promised to "purge all Libyan cities of aggressor and illegitimate forces". The ensuing violence in Libya has already seen at least 21 people killed and 30 people wounded. Prime Minister Fayez al-Serraj has accused General Haftar of attempting a coup. Meanwhile, the UN mission in Libya (UNSMIL) made an "urgent appeal" for a two-hour truce in the southern suburbs to evacuate the wounded and civilians caught in the fighting. "[UNSMIL calls on] all armed parties in the Wadi Rabi area, Al-Kayekh, Gasr Ben Ghachir and Al-Aziziya to respect a humanitarian truce [between 14:00 and 16:00 GMT] to secure the evacuation of wounded and civilians by rescue teams and the Libyan Red Crescent." As news came of the worsening situation in Libya, India’s External Affairs Minister Sushma Swaraj said that India had evacuated its entire contingent of peacekeeping forces from the country. She said 15 Central Reserve Police Force (CRPF) personnel had been moved from Tripoli after the situation there “suddenly worsened”. “The situation in Libya has suddenly worsened. There is fighting in Tripoli. Indian Embassy in Tunisia @IndiainTunisia has evacuated the entire contingent of 15 CRPF personnel yesterday itself. I appreciate the excellent work by the Indian Embassy in Tunisia. #Libya,” Sushma Swaraj tweeted. The U.S. also said on Sunday that it had temporarily withdrawn some of its forces from Libya due to “security conditions on the ground”. The UN is also due to pull out its non-essential staff. Libya has seen no political party form the government after long-time ruler Muammar Gaddafi was captured and killed by rebel forces in 2011. 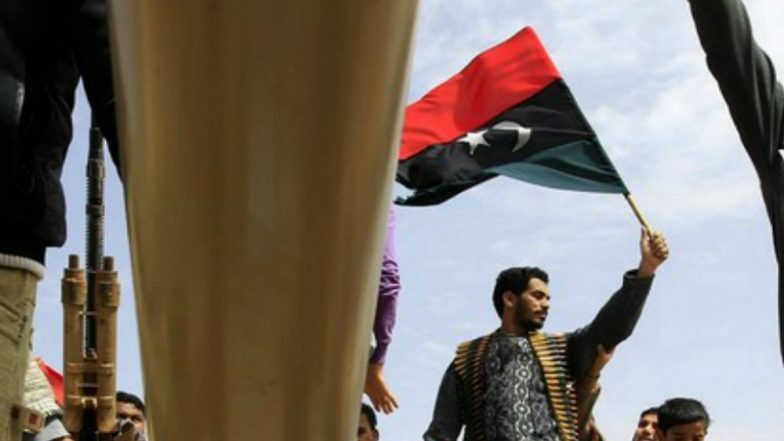 Tripoli and the western parts of the country are controlled by the UN-backed internationally recognised government of Prime Minister Serraj while General Haftar’s Libyan National Army (LNA) is backing the Tobruk-based Parliament, which governs the East of Libya.